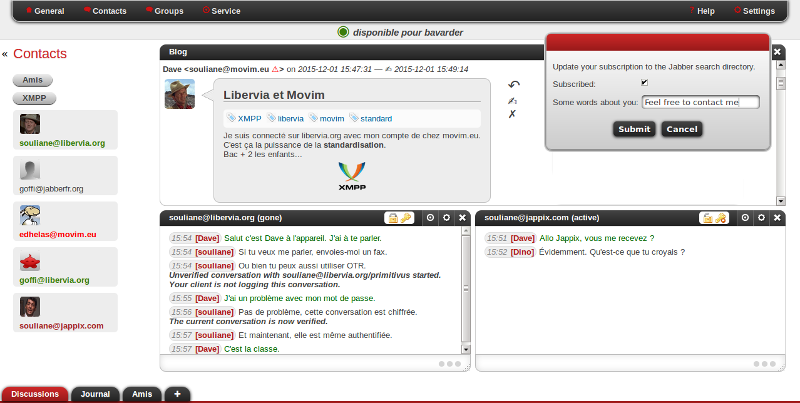 we are a non profit association (based in France) which is developing a communication software libre and decentralised. The associations and the project itself are names " Salut à Toi ", you'll find details on our official website: https://salut-a-toi.org. On the technical side, we have chosen to use a standard communication protocol (XMPP) which allows to use the numerous other sofwares without trick. In addition we have several "frontends", which means that the software is usable on many platforms (desktop, web, mobiles, command line, console). The software is feature rich, and is easily customisable for particular uses (association, university, activity, etc.). On political side, we have written a social contract which is part of our association statuses. It's saying, among other things, that we exclusively use free software. We have a critical point of view on "new media" (which include all internet communications), et we affirm that technology is not neutral: all software and website that we are using are thought for a specific use. That's why we are trying to think about each feature we implement, and more generally we try to bring those critics in the public debate. Finally, we have a project of society and life linked to our project. We are willing to remunerate ourselves in the social economy and to do self-management (salary equality, no hierarchy, consensus, etc.). If we success, we are in the hope to inspire other people to develop free software (or other things) under the same conditions, to build a solidarity network and to join already existing similar networks. We have regular jobs (not linked to the project), and we are working (a lot) on our free time. We are willing to start by working part time on Salut à Toi, and to compensate the wage lost by donations until we find a viable economic model. We are thinking about doing a classical model with technical support and software customisation. We have chosen to use financial platforms we seems compatible with our ideas, that's why we are using Liberapay for the ethical values it shows. How to follow the project evolution? The main developer blog is often giving details on the project progress. The official blog is updated less often, but announce the main informations (new versions in particular). The best place to join us is our discussion room, either by it XMPP address  (sat@chat.jabberfr.org), or by clicking on this link. You can also contact us by email at <contact@salut-a-toi.invalid> (replace invalid by org, the address is also visible at the bottom of our official website). salut_a_toi присоединился 2 года назад.